It’s February! While I am usually pretty indifferent to my birthday month, I now have this guy to change my views on all things romance-oriented. Not only has he planned out a wonderful Valentines evening (I don’t know where we’re going to dinner, but I hear it might include cannoli), but he also is celebrating his birthday this month. I apologize in advance for all the cutesy things posted on the blog this month, but when you are this happy it is hard to control it. Besides my newfangled admiration, my inspiration for this cake came from a picture I saw in this month’s All You Magazine. Their cake was circular, tiered, and flavor neutral, but contained a Valentines staple — conversation heart candies. I knew right away that I had to make my own version of this adorable cake. 1. Generously spray the bottom of the heart cake pan. Bake the cake according to the directions. I added in the eggs, oil, and water you need just so you could make sure you have them on hand. 2. Let the cake cool completely before you attempt to take it out of the pan. Cover the entire cake with a thick layer of cherry icing, making sure it is even. Place the cake in the fridge until the icing is firm. 4. 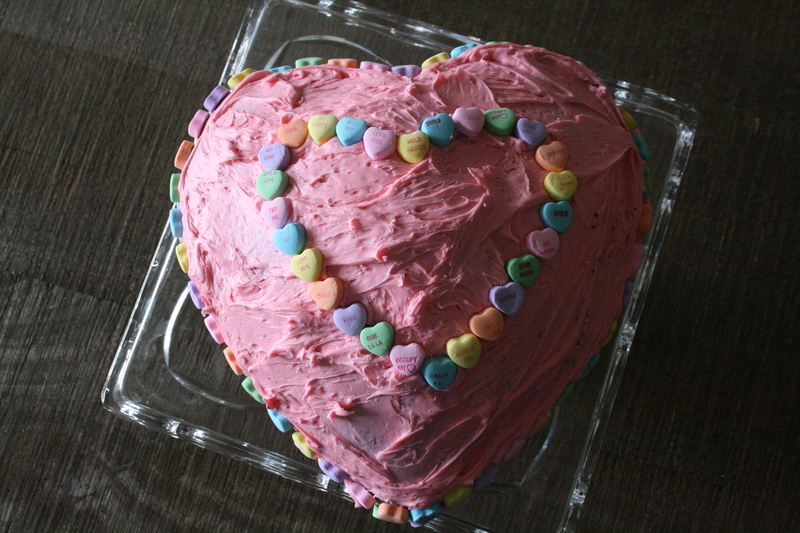 Use a butter knife to draw an outline of a heart on the top of your cake. Press a pattern of candies onto the line to hide it. 5. Keep in a airtight container until serving. Happy February! I hope yours is as sweet as this cake!